Photo 1. Predatory midges are natural enemies of aphids. Here they are shown being hatched as part of an OSU study on the effect of releasing beneficial insects in Willamette Valley Christmas tree farms. Many growers aspire to control aphid populations on field-grown conifers through the use of beneficial insects. 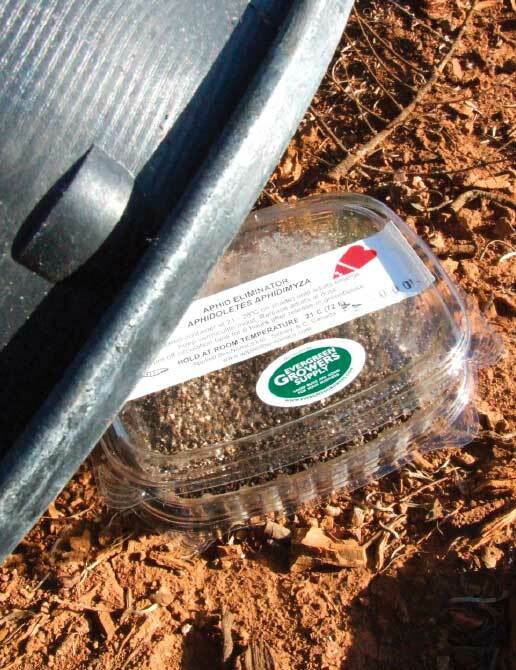 But unlike greenhouse releases of beneficial insects, which happen in an enclosed space, field releases suffer from a number of inherent problems. It is challenging to design studies that can confirm exactly what works best for a given crop in various regions. In the summer of 2014 we began an observational study of aphids in Christmas tree plantations in the Willamette Valley. Our fundamental question was, can we limit aphid damage in Christmas trees by releasing and/or attracting beneficial insects? 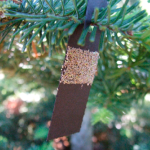 For many Christmas tree growers, the 2013 growing season exhibited some of the worst aphid damage of the past decade, leading to increased insecticide applications. Sensitivity over bee deaths due to pesticide application has raised interest in alternative pest control strategies for a range of field-grown crops. • Aphidoletes aphydimyza (predatory midge). Our target release was 10,000/acre. The midges arrived as larva and were released as adults (Photo 1) within days of hatching. • Aphidius matricariae (small parasitic wasp). Our target release was 2,000/acre. The initial release of adults was 400/acre, then 600/acre, then 1,000/acre. • Chrysoperla rufilabris (green lacewing). 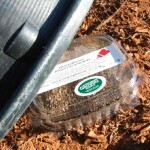 Our target release was 5,000 eggs/acre, released on sticky cards (Photo 2) spread around fields. Fondren et al. (2004) suggested that a release of this generalist predator could lower aphid populations in Fraser fir Christmas trees. Photo 2. 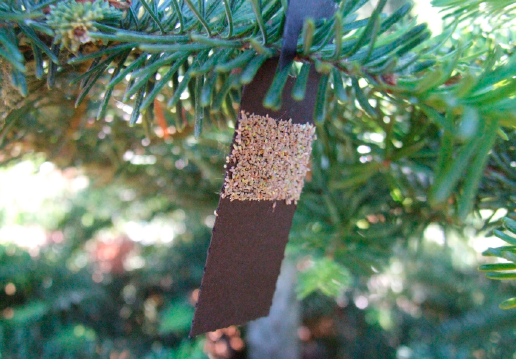 Another beneficial insect, green lacewings were released as eggs on sticky cards attached to the limbs of noble fir trees. Adults prey on mites, aphids and other small arthropods. The releases were conducted in three stages, which took place the first week of May, the middle of May, and the first week in June. Another way to improve biological control of pests is to attract natural enemies into the field. Plants release volatile chemicals when insects feed on them. These odors can attract natural enemies. Methyl salicylate is one common plant-produced odor, which is available as a commercial lure (Predalure™). In addition to the natural enemies, we also dispersed 15 Predalure tabs/acre (Photo 3). Methyl salicylate has shown some potential for being an effective component of an integrated pest management strategy, although its ability to improve pest management is not always clear (Rodriguez-Saona et al., 2011). 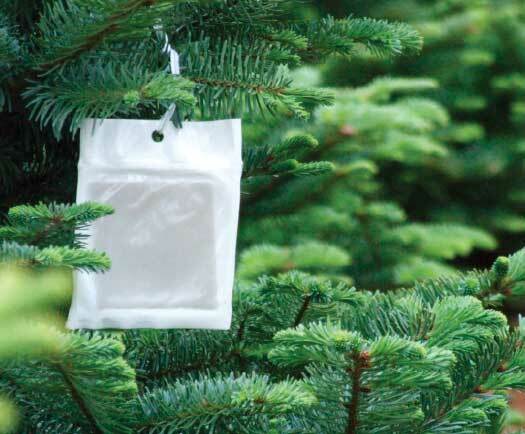 We released natural enemies at eight Christmas tree sites which were planted with a mix of noble and Grand fir. 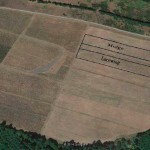 The treatment areas varied from one to four acres. We paired green lacewing and midges at five sites (Photo 4). At three sites, we paired the release of parasitic Aphidius wasps with Predalure. For the sake of comparison, we included non-release control sites at nearby and adjacent tree fields. The final release counts on one site varied somewhat from our target rate: this four-acre field received only 30,000 Aphidoletes, rather than the desired 40,000. Starting June 8, 25 random trees per acre at each site were inspected every two weeks until mid-August, such that each site was scouted five times. During inspection, each tree was evaluated for live aphid presence on the trunk as well as new and older needles, on a scale ranging from 0 (none), 1 (1–20 aphids), and 2 (20+ aphids). Photo 3. In addition to the beneficials, researchers also dispersed a commercial lure (Predalure™), which contains methyl salicylate. The chemical has shown some potential for being an effective component of an integrated pest management strategy. Mummified eggs and the presence of cast aphid skins were recorded for presence or absence. Visual damage from aphids was rated from 1–4 (1 = none, 4 = heavy aphid population), and all aphid predators were tallied when found. At the end of the study, all observed predators were tallied for all sites. Ladybugs and hoverflies turned out to be the most common aphid predator identified. Neither was part of our releases, which suggested that naturally occurring beneficial insects could have a positive role in Christmas tree fields. Released lacewings were the third most commonly observed beneficial. Mummies from Aphidius wasp activity were never observed, and Aphidoletes midge predators were rare (the small size of Aphidoletes made it difficult to identify). Other insects that were found included minute pirate bugs, damsel bugs, stilt bugs, predatory mirids and soldier beetles. Of the eight fields, only three sites showed increasing aphid populations during the summer. Of these fields, all had more natural enemies observed on trees with higher aphid infestations. Aphidoletes midge and green lacewings were released at these sites. Further study is necessary to find a method for increasing the efficiency of each treatment. This may include testing the species separately, altering release times or release methods (releasing adults, eggs or larvae). 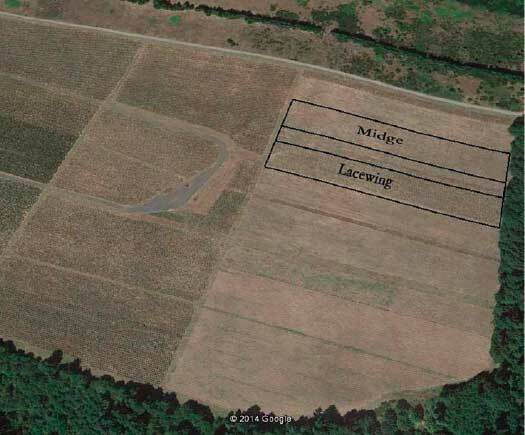 The five fields that did not have severe aphid infestations still contained beneficial insects. Also, three of the five fields that had low aphid populations were treated with the Aphidius wasp and Predalure, though almost no Aphidius activity was observed. Predalure may have potential, though the lack of aphid activity in general limited our ability to draw conclusions on effectiveness. Sadly for our trial, 2014 was not a problem year for aphids across the region. We can speculate as to why, but this observational study was a first step to see if we could find signs of activity from the released natural enemies within fields. Photo 4. Two of the eight sample study sites where beneficials were released. The treatment areas, which varied from one to four acres, were planted with a mix of noble and Grand fir. Most of the aphid predators we observed were not from our releases; therefore, enhancing these existing predators is worth looking into. Conservation techniques, such as planting native floral vegetation, can help sustain these predator populations with pollen, nectar and alternative non-pest prey before pests are available in the field. Among the predators we did release, lacewings were the most numerous. We have no way to determine if the lacewings we found hatched from eggs we placed on trees, but releases of these beneficial insects are straightforward and deserve additional review. Evaluating the impacts from Aphidius wasp releases and Predalure was difficult. A study of releases on smaller sites with adequate spacing from homogenous control sites would be necessary to draw firmer conclusions. Ryan Hill is studying biology at George Fox University and was a summer student intern funded by an OAN/ODA research grant in 2014. Jana Lee is a research entomologist at the USDA-ARS Horticultural Crops Research Unit, which focuses on the biology of ornamental and small fruit pests, and biological control. Special thanks to Glenn Ahrens, Michael Flores, Amy Grotta, Mary Halbleib, Gayla Hansen, Paul Jepson, Jeff Parson, Judy Kowalski, Betty and Pat Malone, John Mauer, Rod McNiel, Terry Muilenburg, Tom Norby, Robin Rosetta, Victoria Skillman and Ric Sward for helping in this investigation. This project was funded by a grant from the Clackamas OSU Extension Innovation Fund. Fondren, K. M., Walter, A. J., & McCullough, D. G. (2004). Insect predators and augmentative biological control of balsam twig aphid (Mindarus abietinus Koeh) (Homoptera: Aphididae) on Christmas tree plantations. Environmental Entomology, 33(6), 1652–1661. Rodriguez-Saona, C., Kaplan, I., Braasch, J., Chinnasamy, D., & Williams, L. (2011). Field responses of predaceous arthropods to methyl salicylate: A meta-analysis and case study in cranberries. Biological Control, 59(2), 294–303.